If you are a Flash programmer or designer then Dr.Explain will help you to document your Shockwave Flash (SWF) application. With Dr.Explain you can easily create screenshots of your Flash program and annotate them. Dr.Explain's screenshot capturing tool analyzes the internal structure of your Flash application and automatically creates numbered callouts for all active elements: buttons, icons, and hotspots. All you have to do is just add some descriptive text to complete the screen annotation. 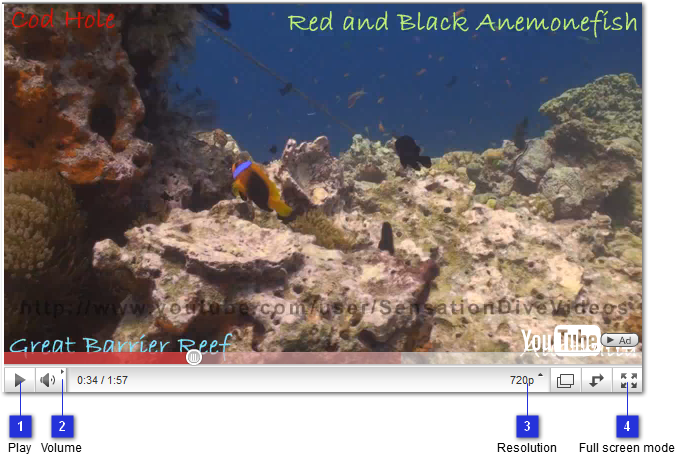 Here is a captured picture of Flash application (YouTube.com embedded video player) running in MS Internet Explorer. Dr.Explain recognized all active areas and controls, enumerated and labeled them. Then you can export your help pages in HTML format and upload to your website like we did with this page. Put it together with your Flash application to create interactive help system for it. Dr.Explain can also create help for Windows software applications and Web pages.